საზოგადოების კვლევის ცენტრის დირექტორი, პროფ. მარინა მუსხელიშვილი, განათლებით მათემატიკოსი, პოლიტიკურ მეცნიერებებში მუშაობს 1995 წლიდან. მისი შესწავლის სფეროებია პოლიტიკური ინსტიტუტები, სამოქალაქო საზოგადოება, სოციალური სტრუქტურა. აქვს სამეცნიერო ხარისხი, გაიარა რამდენიმე სტაჟირება საზღვარგარეთ, მათ შორის აშშ სახელმწიფო დეპარტამენტის დაფინანსებით 2002 წელს იმყოფებოდა კოლუმბიის უნივერსიტეტში, ხოლო 2009-2010 წლებში ფულბრაიტის პროგრამით - ვაშინგტონის უნივერსიტეტში სენტ ლუისში (მისური). 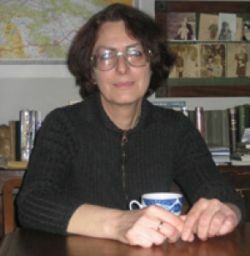 Marina Muskhelishvili, Lia Mezvrishvili. Power to Lead, Power to Decide, Power to Veto. A Theory and Practice of Manipulative Democracy Paper prepared with the support of ASCN and presented at 3rd ASCN annual conference, 2013, Tbilisi. მარინა მუსხელიშვილი, ლია მეზვრიშვილი, ბექა ნაცვლიშვილი მარიამ ელიზბარაშვილი. 2012. სოციალური კაპიტალის როლი საქართველოს სოფლის განვითარებაში. გამომცემლობა უნივერსალი. თბილისი. 130გვ. Schofield, Norman J., Gallego, Maria E., Jeon, JeeSeon and Muskhelishvili, Marina, Modelling Elections in the Caucasus (October 3, 2011). Muskhelishvili Marina. Institutional change and social stability in Georgia. Southeast European and Black Sea Studies. Routledge.. Vol. 11, No. 3, September 2011, 213–228. Muskhelishvili M. 2010. Georgia in a New Wave of Transformation. The Caucasus and Globalization. V. 4. 1-2, CA&CC Press, Sweden. p. 35-42. Muskhelishvili M., Z. Abashidze. 2010. Science or ideology? : Georgian crossroad. In: Rainer Eisfeld, Leslie Pal (eds). Political Science in Central and Eastern Europe: Diversity and Convergence. Barbara Budrich. p.135-147. Muskhelishvili M. , G. Jorjoliani Georgia's ongoing struggle for a better future continued: democracy promotion through civil society development. Democratization. Volume 16, Issue 4 August 2009. p. 682 - 708. Muskhelishvili M. 2008. ‘Globalization and the Transformation of Institutions and Discourses in Georgia’. In Anthropologues et e´conomistes face a` la globalisation [Anthropologists and Economists Facing Globalization], ed. Eveline Baumann et al., p.171–87. Paris: L’Harmattan. Muskhelishvili M., G. Jorjoliani. 2006. Country report based on research and dialogue with political parties. Georgia. International IDEA, Research and Dialogue with PoliticalParties. http://www.idea.int/parties/upload/Georgia_report.pdf. მუსხელიშვილი მ. 2000. სამოქალაქო საზოგადოება. ბროშურა, საზოგადოების კვლევის ცენტრი, თბილისი.